Edmonton has posted an open source map showing the locations of all the edible fruit trees on city properties. Out for a walk and feeling a little peckish? 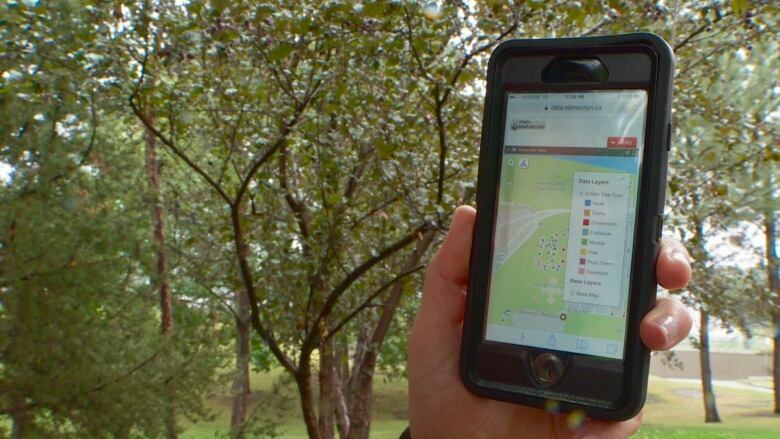 A new City of Edmonton map now makes it possible to find the closest tree with edible fruit. Available online, the Open Data Edible Fruit Trees map allows people to zoom in on more than 22,000 fruit trees. The list includes apple, cherry, plum and pear trees. There are even saskatoon berry bushes. "People are interested in it, and it contributes to that local food security as well," said Nicole Fraser, manager-supervisor with the city's beautification and greener initiative. "We want to promote a local food movement and support local citizens in that local food movement." Residents can take their ladders and pick on public property until their buckets are full. The city urges harvesters to do so in a safe manner and not damage the trees. Make sure you wash all fruits and berries, since they are growing in public spaces. If you're unsure about what the berry or fruit is, don't eat it. The information about the trees was already available as part of the city's urban forest management system. The city has been monitoring the trees and has an online map that marks each tree, except in heavily wooded areas such as Whitemud Creek, Millwoods Ravine or the dense river valley. An inventory team keeps track of all trees on boulevards, in parks and along roadways on public property. The information includes species, diameter of trunk, height, age and health as part of the larger plan to increase the canopy over the Edmonton region. "The city has an urban forest management plan of a goal of expanding the canopy from 10 to 20 per cent in 10 years," Fraser said. "So that is doubling the urban forest canopy. And if we didn't keep track of how many trees were in the city, we wouldn't be able to grow the number of trees." People can add their own stories about trees by using the yegTreeMap. By creating an account, you can upload your own trees and track their progress.